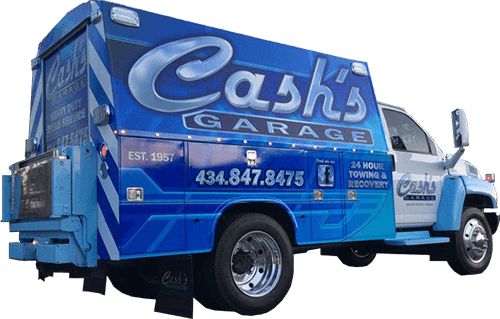 For over 50 years, Cash’s Garage has been helping drivers get off the side of the road and get the repairs they need to get back behind the wheel. We provide full towing and roadside services, as well as transport for vehicles and equipment. Back at our shop we can deliver complete repairs and maintenance, regardless of what you’re driving or what the issue is. Give us a call for 24-hour service that’s reliable and honest. We offer oil changes, brake service, tune-ups and all factory-scheduled service. We’ve even got the equipment necessary to rotate, rebalance and align your tires. There’s nothing convenient about auto troubles, which is why Cash’s Garage goes above and beyond to provide you with convenient services that get you back out on the road safely. We’re the local authority on auto repairs and towing service in Madison Heights, VA, regardless of the vehicle or the issue. We can dispatch a heavy-duty tow truck to you, just as easy as we can give your car an oil change or rebalance the tires on your truck! We’ve worked hard to distinguish ourselves as a premier automotive repair shop in Madison Heights, VA. When you call us, you’re always going to get prompt service from a friendly professional who knows what they’re doing. We waste no time in providing towing or roadside service, and we try to make things as painless as possible. We know you’re in a jam—trust us to help you out of it. Back at our shop, there’s not much we can’t do for your vehicle. We know our way around your engine and have the capabilities to do transmission work, as well as service your undercarriage. Broken down and need a tow? Trouble with your engine, transmission or undercarriage? Cash’s Garage will get you off the road… the back on it! Call for towing and auto repair today. Don’t let auto troubles frustrate you any longer than necessary. From roadside service to towing, repairs to routine maintenance, Cash’s Garage delivers excellence. We’re the only call you need to make, regardless of the problem you’re stuck with! We’re a third-generation, family-owned business that focuses on customer satisfaction. We provide unbeatable service by using some of the best equipment available! Our experience with auto repair and towing stretches back to 1957! We’ve been doing both longer than most other service providers and take pride in our abilities. Our business proudly maintains an exceptional rating with the Better Business Bureau (BBB). Our services are available 24 hours a day, so no matter when you find yourself in a jam, we’ll be standing by to get you out of it! We have the versatility to take on all types of auto repairs, as well as towing services for cars, trucks, SUVs and heavy equipment. No matter what you’re driving, we can help!